After a restless hotel night in Mammoth Lakes with upstair neighbours having a party of some kind – I’m probably not used to sleep indoors and having neighbours anymore – I walk over to Vons supermarket for groceries. My next stretch is the biggest and the baddest I’ve ever done so far. I’m about to hike all the way to Kennedy Meadows. A daunting 212 miles away, which I’m going to shoot for in one attempt, without any stops for resupply. The reason why I do this: the High Sierras are just not to be taken lightly. Especially not in this late season, where the risk of getting stuck in a snow storm has increased. In the next 212 miles, the trail runs over 8 mountain passes, each between 11000 and 13000 feet in elevation. And I have to climb them all. So I’m in a hurry and I want to get over the High Sierras as soon as I can. Because of the higher elevation, my body will need more energy to keep performing. So I need to take more food with me. I have to carry food and fuel for about 11 days. Which will be heavier than anything I carried before throughout my hike. The next problem arises. I have to fit all this food in my bear canister. That is not going to be easy. 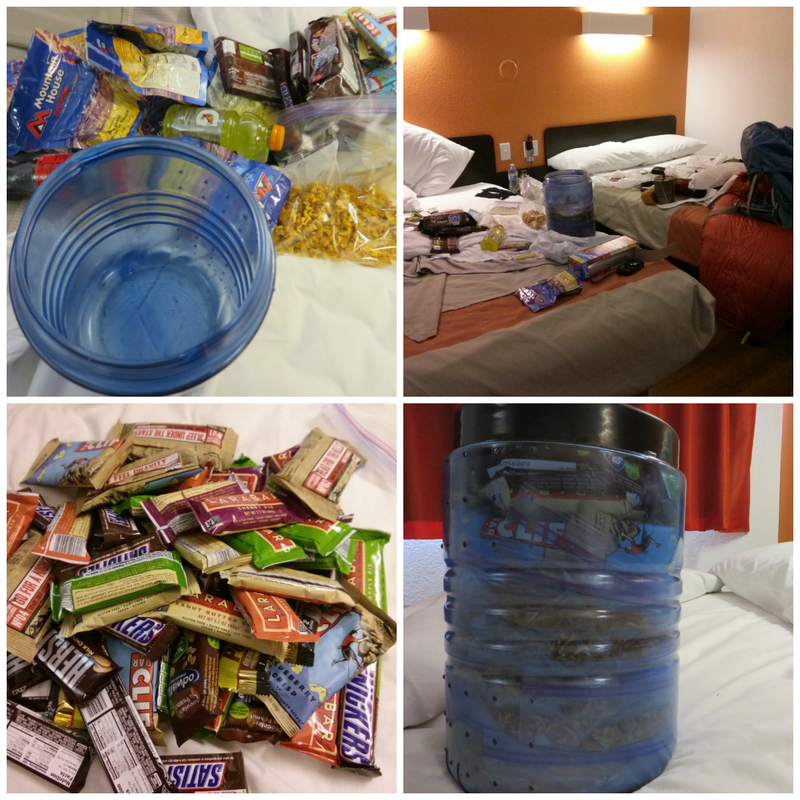 I buy a crazy amount of power bars and Snickers, and freeze dried meals, which I repack into small ziplock bags (less weight than the packaging Mountain House uses for their meals). I have to literally sit on top of the bear canister to get it all in there, but finally it works! I’m ready to go. My pack weights more than half of my own body weight. Later that day, I get a ride back to Agnew Meadows trailhead and I hike out. It’s still snowing and it’s freezing cold. My pack is so heavy that I can’t believe that I’m able to carry it. But as long as I can place one foot in front of the other, I’m alright. I manage to hike to Crater Creek, 11 miles in. It’s still snowing when I pitch my tent. I feel anxious about being by myself, knowing that I’m doing the hardest part of the Pacific Crest Trail alone. The most remote part. No roads. No towns. For 212 miles. Nothing but wilderness. The anxiety doesn’t leave me and sleep stays far away. 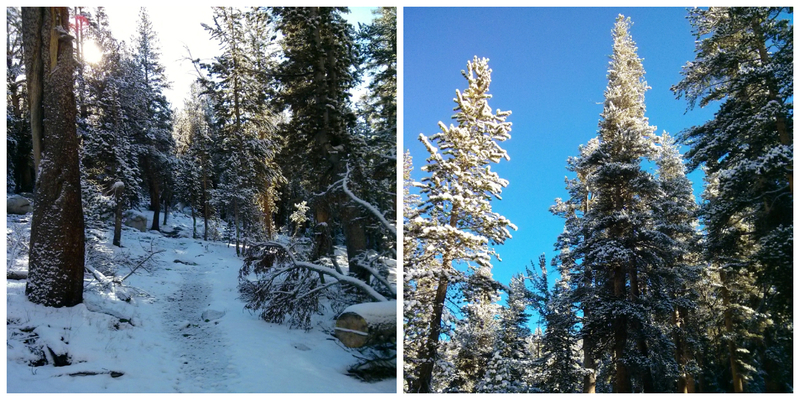 The next day, the forest is so beautiful, all white and pristine. I find bear tracks in the snow. My fingers are freezing off my hands. I can’t feel my toes. Yes. Life is good. The snow melts quickly enough though. The sun is shining and I find comfort in the fact that the weather forecast for the next 10 days is excellent: sunshine and clear blue skies throughout. I hike and I feel strong, despite of the weight I carry. Lake after lake I pass. There is nobody here but me. The silence is deafening. The beauty of the landscape is indescribable. It feels somehow surreal to be here. As if I’m starring in a movie and this is all superimposed. The beauty hits me hard. And I open myself to it. It is so overwhelming, that I can’t do otherwise than break down and cry. Right here on the trail. With this incredible landscape around me. Then I realise that the landscape is not only around me, but also in me. And this comes to mind: everything is perfect. All the rocks and stones are in place. The lakes. And the trees. They don’t have to be better, or more beautiful or larger than they already are. They are just… right. All in chaotic perfection. Just like it is suppose to be. This is nature’s purpose. Nature’s natural state. And thus my natural state. All is good. All is how it suppose to be. No need for change. No need for wishing something else to happen to me, or waiting for something better around that corner. This is it. I am what I see. And I see what I am. Nature in all its chaotic perfectness. Hi Vi., just received your description of THIS part of the trip. Awesome, inspiring! And such beautiful pictures! Enjoying it all. Hi Berty!! Yes I finished my thru-hike on November 11 but didn’t had the time to update my blog. Now, relaxing in San Francisco, I have time to do that. Didn’t receive your whatsapps by the way. But I’m using another phone so that might be the cause of it!